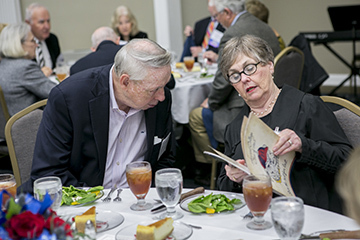 As part of Samford University’s 2015 homecoming, the Class of 1965 held its 50th reunion. This class was actually the last one to graduate from Howard College, which was renamed Samford University the following year. Forty-one people registered for the weekend, which was filled with many reunions of old friends and classmates. The lunch included recognition of certain attendees and ended with the alumni singing the Howard College Alma Mater. The class also participated in the Golden Bulldog brunch, which honors graduates of 50 years or more.